For financial year 2018/19 how does your youth development budget compare to financial year 2017/18? 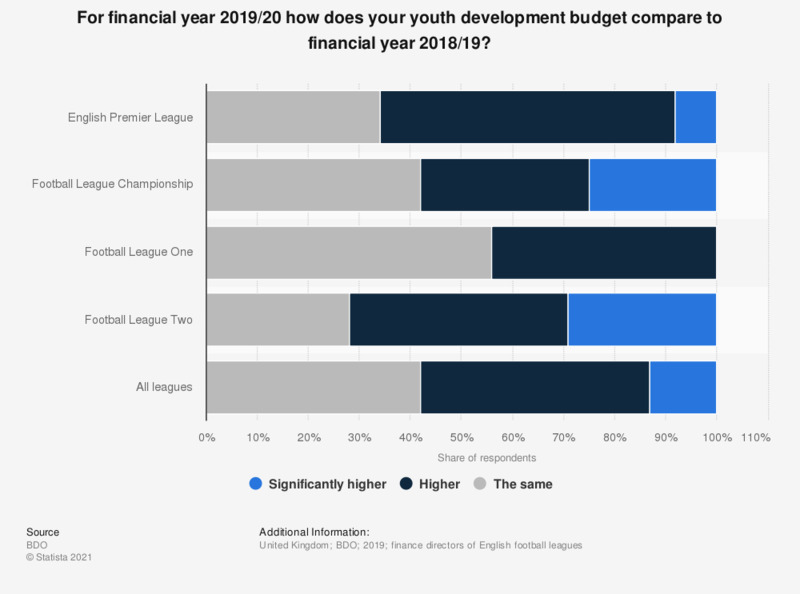 This statistic shows how the youth development budgets of United Kingdom football clubs in financial year 2018-19, compared to their budgets in financial year 2017-18, according to the clubs' finance directors in 2018. In the case of most major leagues, their youth development budget was slightly higher than in the previous year. The biggest difference was reported in the English Premier League (80 percent higher). What has been the impact of the economic conditions on the match tickets sales in the current financial year? Do you think the wealth gap between larger clubs and smaller clubs in general is: widening, narrowing or unchanged? United Kingdom (UK) football clubs: Do you expect to make a profit before and/or after player trading and amortization in your next accounting period? Do you use the wages to turnover ratio as a key performance indicator of the club's financial health?